I'm totally inspired by the colors and tones in this apartment. The bright whites look great with theses timeless wood colors and the green plants make it feel fresh at the same time. I good note to end the week on! Yes! 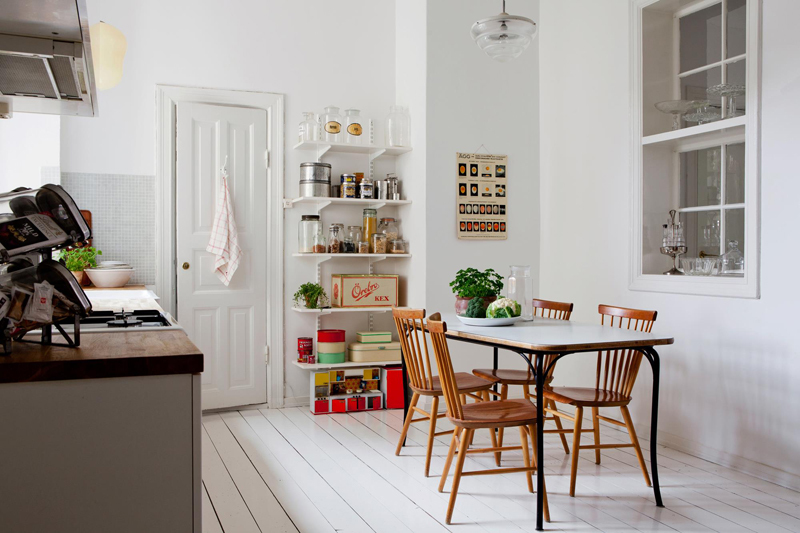 A clean white kitchen with bright happy colored utensils and storewares! The color palette of this place makes it so homey! It looks so fresh and bright. Very nice indeed! Not to mention great light fixtures! What does your kitchen look like? Is it all white in a rental? love the kitchen!!! so much! Hi, what a beautiful blog to discover! I love your style and pictures, and I have to add you to my blogroll asap. Ahhhhhhhhhh. So crisp and clean! I can't wait till I can actually decorate the place where I'm living. It's hard right now. Thanks for sharing this awesome inspiration! Beautiful inspiration and good reminder... "it doesn't always need to be Black & White to look fresh, clean and modern!